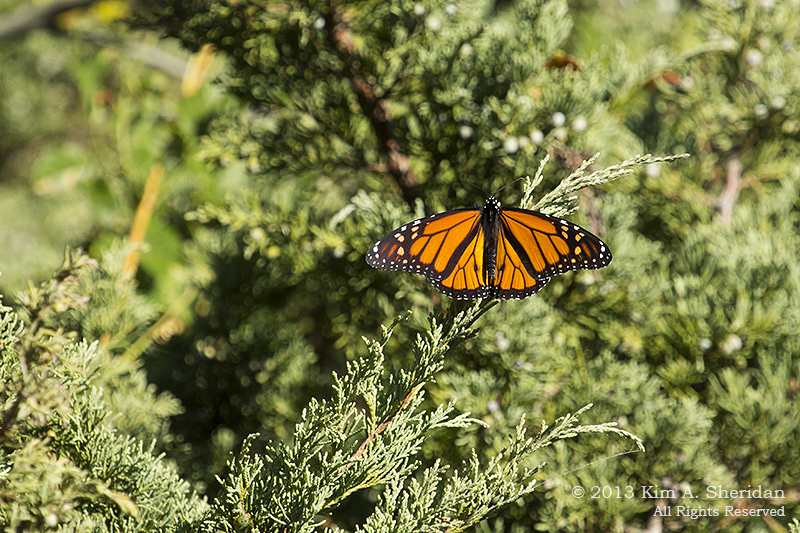 We didn’t know it then, but we were witnessing the migration of the Monarch butterflies. Scientists now know that these orange and black insects fly from the northern U.S. and Canada to overwintering grounds in Mexico. 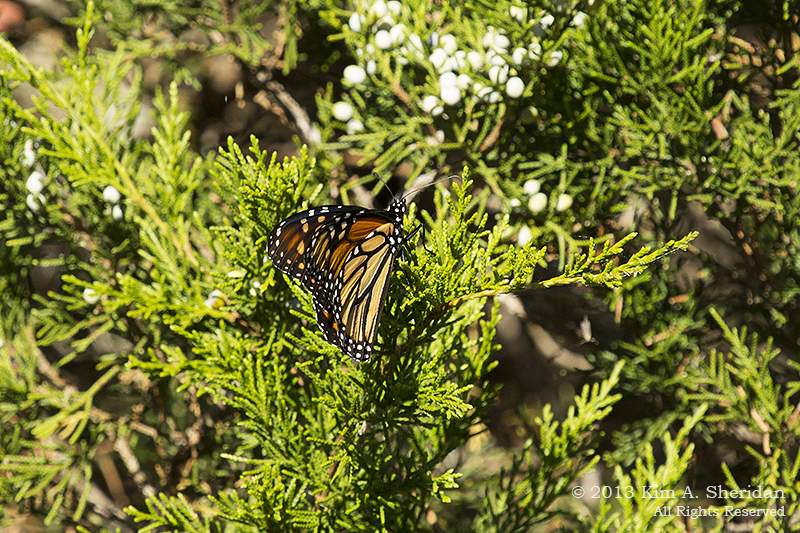 Just like for birds, Cape May County is an important stopover for migrating Monarch butterflies. A Monarch butterfly has a four inch wingspan and weighs a fraction of an ounce, yet it still manages to fly 2,500 miles in a short period of time. What may be even more amazing is that the butterflies that fly south have never been to Mexico. Neither have their parents, or grandparents or great-grandparents. It’s their great-great grandparents that left Mexico the previous February. They made it as far as Texas or Oklahoma before laying the eggs that would become the first generation of the year. That first generation went through the life cycle of egg, caterpillar and chrysalis before becoming butterflies that would continue the journey north during their six week life. The second generation was born in May or June; the third generation in July or August. 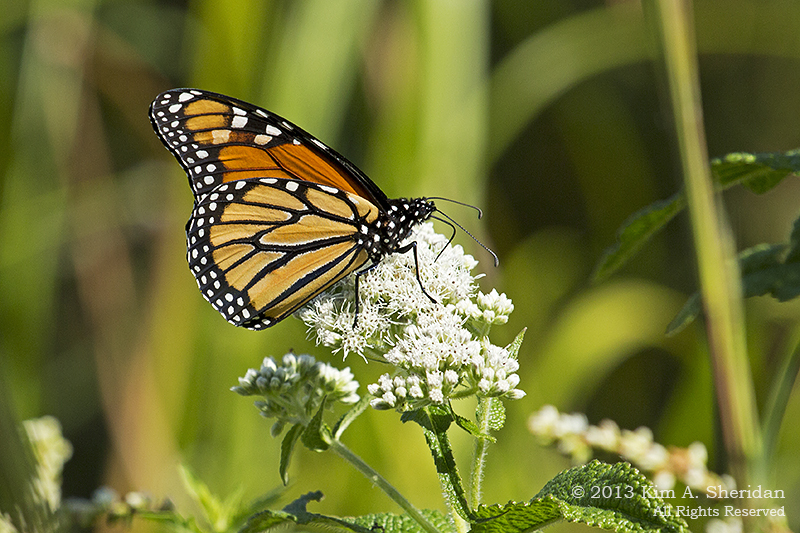 This butterfly is from that third generation; it was photographed at Heinz NWR in August. The other Monarchs shown in this post were seen in Cape May County in September; they are members of the fourth and final generation of the year, born in September or October. These are the butterflies that migrate south. They don’t immediately start a new reproductive cycle as their parents did. Instead they enter a non-reproductive phase known as diapause, which can last six to eight months. During that time, they fly to Mexico, spend the winter, and then return north to start the next year’s cycle. All that flying is accomplished on an all-liquid diet consisting mainly of the nectar of plants like milkweed, goldenrod, aster, and others. The butterflies drink the nectar through a straw-like appendage called a proboscis, shown coiled up, above. 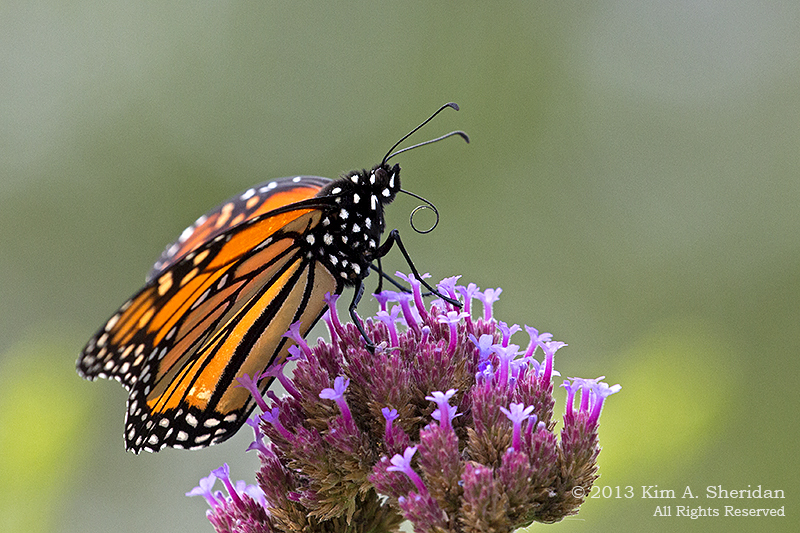 The Monarch caterpillars are much more finicky – they only eat plants of the milkweed family. So Monarch females are careful to seek out milkweeds on which to lay their eggs. FUN FACT: Monarchs are poisonous! A chemical in the milkweed they eat as caterpillars provides a distasteful and dangerous defense against predators. And the predators know it, and avoid them. This in turn is exploited by the Viceroy butterfly, which isn’t poisonous but looks very similar to the Monarch, an adaptation called mimicry. 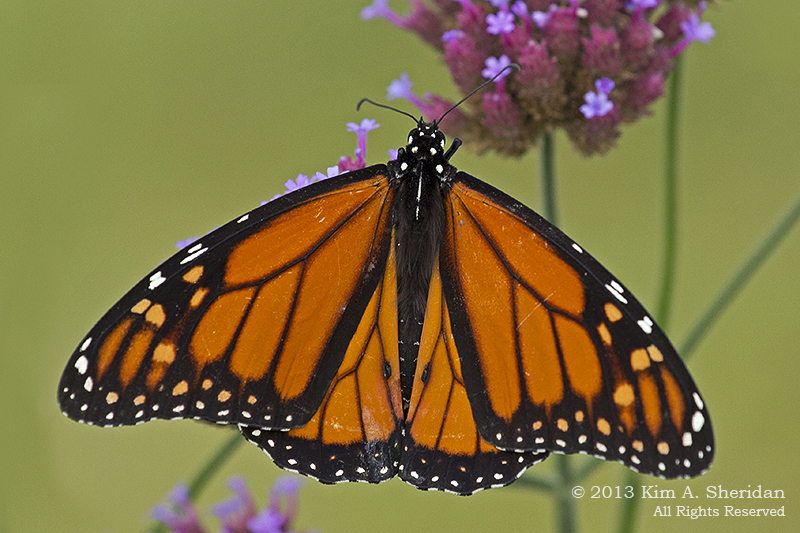 This is a male Monarch. How do I know? See those small black spots on the hind wing near the end of the abdomen? That’s how. Females don’t have those spots. 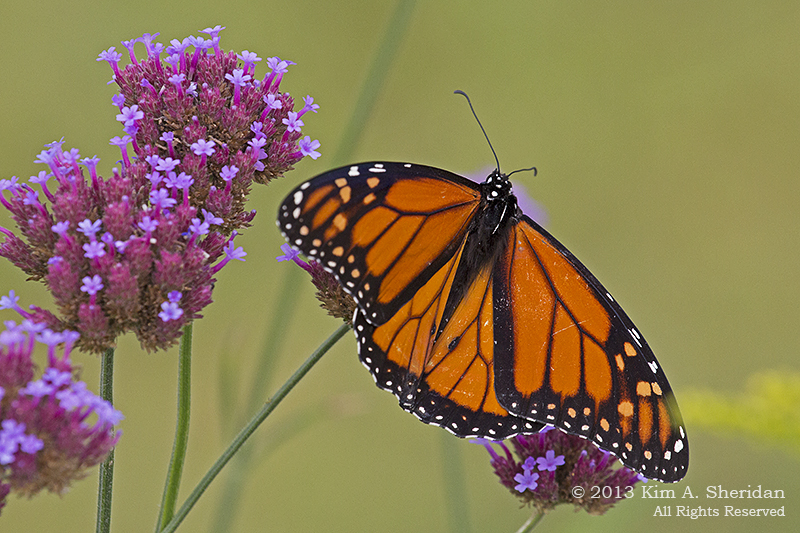 CONSERVATION PIECE: The Monarch butterfly’s survival as a species is threatened both by deforestation in their wintering grounds and the disappearance of milkweed plants due to herbicide use in the U.S. Want to help the Monarch thrive? 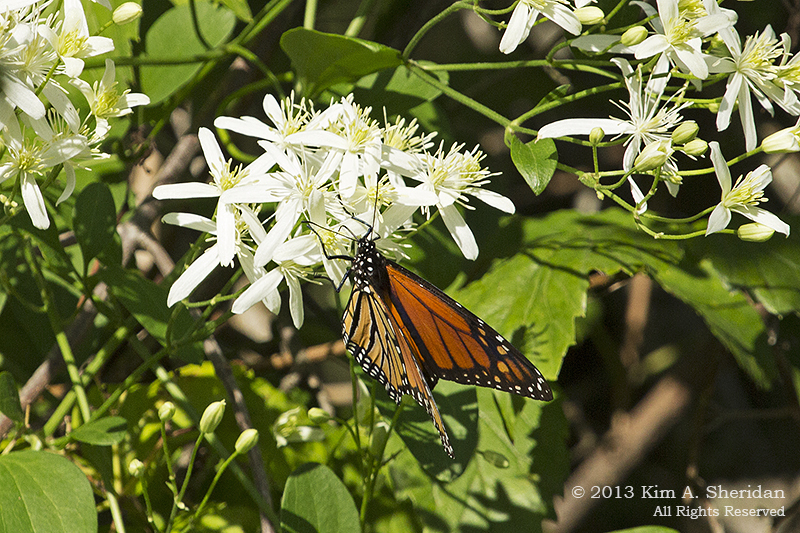 Go to your local garden shop, ask for milkweed plants native to your area, and plant them in your yard. Host a caterpillar! 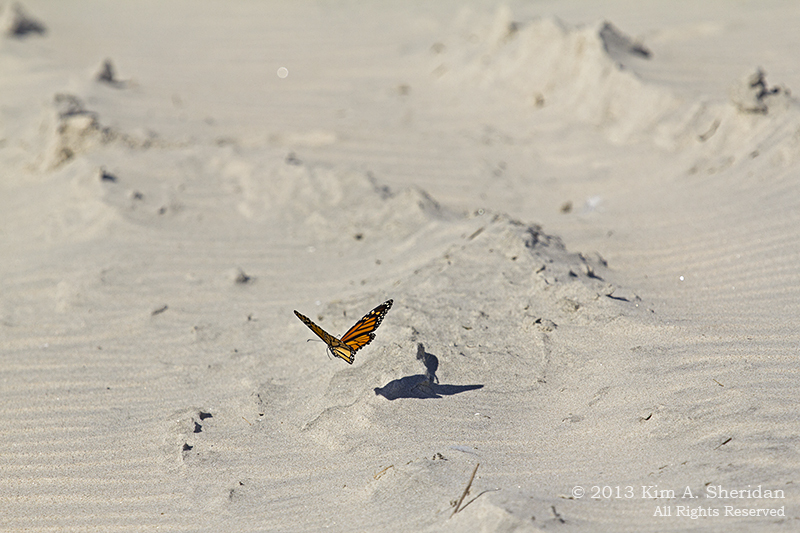 It just wouldn’t be September at the shore without these tiny Kings of the Air. This entry was posted in Jersey Shore, Nature and tagged Butterflies, Cape May Point State Park, John Heinz National Wildlife Refuge, Wildlife by Kim. Bookmark the permalink.